The first football pitch of Viktoria was a ground in Bory. The Municipal Authority of Pilsen gave it to the new club under the football ground called SK Český Lev. However, they trained in the rooms of today’s ice-hockey stadium “na Dobytčáku”, because going to Bory was quite far away. In 1920 Viktoria´s big dream became true; they gained a real football gound. It was bought from SK Plzeň for 20 000 Czech Crowns and it was situated in the Královské Square (nowadays náměstí Míru). SK club moved to Bory, Máchova Street. The members of Viktoria paid the money needed for buying it. The biggest credit of it made vice chairman Vališ, who gave his own savings of 14 000 Czech Crowns. The ceremonial opening was held on 26th September, when the team also played a match with Hagibor Praha. The match finished a 3:3 draw especially thanks to two offenders – Štapl who scored twice and “Mindě” Kučera once. In 1929 the club was not lucky and the football pitch which was expensive and hard to build was lost. They had to move away because of a big town development. Thus the club, with great chances to become one of the top teams in the whole country, economically strong, technically well-equipped and with the players of high quality, stayed without a football pitch. The discussions about the ground with the city council immediately began and were successful. Viktoria obtained for rent a place in Roudná in Luční Street. They also bought the seating area for 13 000 Czech Crowns. Each member of the club had to pay 100 Czech Crowns for the building of the new football pitch and had to work for 50 hours there. The new stadium is still standing there till this day and is still in quite good conditions. The stadium named Viktorka was ceremonially opened on the 11th May 1930. The Budapest club Hungaria was invited and came well trained and ready to jump into the game – and won 4:1. The ball which was used to play this match was thrown off the plain into the middle of the football pitch. The football ground was roofed in 1933 and there were also a room made for trophies. The stadium in Luční Street sustained damage during the 2nd World War in 1945. During the air-raid of the Americans to Pilsen on 17th April the stadium was damaged, only ruins remained there after that. On 24th May 10 000 people gathered at the ruined stadium because of the match against a team from the American army. Viktoria won 11:1 and in June the stadium was ready again for the big football matches. Despite being damaged by fire the stadium was rebuilt thanks to the great help of other clubs. In 1953 some works in Štruncovy Sady started and it was opened for public in 1955 on the occasion of Spartakiada. Later on there was finished the Brána borců and the main seating area, which was in those days one of the best ones in the whole of Czechoslovakia. B. Kavan and J. Brabec from the Pilsner Stavoprojekt were the designers of the project for the stadium, whose capacity was 35 000 people out of which 7 600 seats were for sitting. Between 2002-03 a wide reconstruction was undertaken in the City stadium in Štruncovy Sady in order to comply with the standards of the Football Association and therefore the stadium capacity was lowered to 7,425 seats. In 2008 an artificial lawn of the third generation was opened in Luční Street, where except for it there are three more lawn football pitches. The statics of the origin wooden stands were seriously affected because of the big floods of 2002 – it was drowned under 2 meters of water and so had to be taken away in parts 2003. Only bricked changing rooms remained. 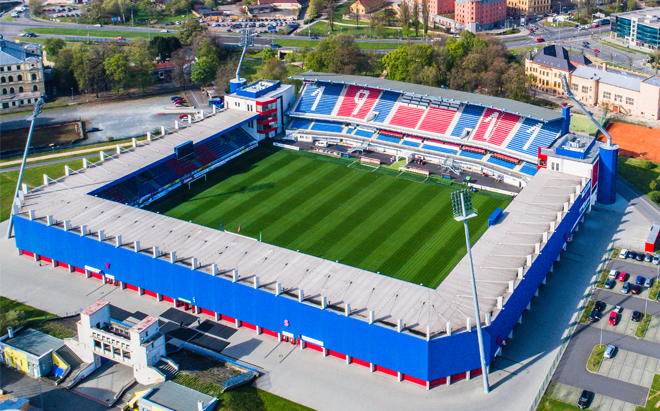 Building a new stadium of Viktoria Plzeň was in consideration for several years. The city representatives rejected building a completely new stadium in Bory and accepted the idea of rebuilding the current stadium in Štruncovy sady. The stadium at the time did not comply with the UEFA requirements so the Europa League match against Besiktas Istanbul in July 2010 had to be played at Eden stadium in Prague. This made fans a bit angry. In September 2010 they organized a demonstration in front of the Town Hall and gave the city representatives the foundation stone of the new stadium with writing „Plzeň together“, they also handed over a petition to support the new building, which was signed by over two thousand sympathizers. Much awaited new stadium building was commenced in Štruncovy sady on 1st April 2011 by pulling down old concrete stands. All of them were demolished and athletics track was removed, too. Only the grandstand remained to which the pitch was moved forward for 18 metres. New stands were built around that. A completely new heated lawn was laid and the return match against Pjunik Jerevan in July 2012 was played on it, at the time when the stands were only growing. The first match at the reconstructed stadium called Doosan Arena was played on 16th February 2012 within the first play off round of the Europa League. Viktoria´s opponent was German Schalke 04, with that Plzeň tied with promising result 1:1. The crowd counted 11 400 excited fans. Although Viktoria lost in Veltins Arena 1:3, their fans stayed loyal and Doosan Arena´s was regularly crowded by number of people attacking 10 000 for Gambrinus League matches as well. The gate records were regularly broken in Štruncovy sady in the season 2012/13 as well. The new stadium together with Viktoria´s excellent game attracted average match attendance 10 300 fans, which was the biggest number within the whole Gambrinus League. Spring part of the season was opened by the play off Europa League match against Italian Napoli. On 90 minutes of the game Viktoria celebrated advancing to round of 16. In this phase of the competition they met Fenerbahce SK and Štruncovy sady announced sold out again. At the beginning of 2013 the city of Plzeň promised investments concerning the grandstands reconstruction. After spring bulding the stadium met the UEFA standards for the Champions League. At the beginning of the season 2013/14 Doosan Arena changed in the colours of the Champions League. Viktoria beat NK Maribor 3:1 in the third qualifying round. The first match of the Champions League group stage was played in Plzeň on 17th September 2013 and the opponent was Manchester City FC. Viktoria was beaten by this famous club 0:3. Doosan Arena also hosted the matches against Bayern Munich and CSKA Moscow, later the stands were ful also for the match against Shakhtar Donetsk and Olympique Lyon. During the winter break in 2014/2015 season Doosan Arena has been changed again. The south-sector V16 has been builded and the capacity has grown to almost 11 700 spectators. There have also been created a two skyboxes under the roof of the arena.